That's an average of more than 16 spills a day. And it's a significant increase since 2010. 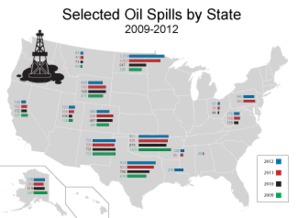 In the 12 states where comparable data were available, spills were up about 17 percent. Drilling activity in those states, though, rose 40 percent during that time. More common than the Newfield blowout are 100-gallon leaks that are contained to the well site and get cleaned up the same day. But together they add up to at least 15.6 million gallons of oil, fracking fluid, wastewater and other liquids reported spilled at production sites last year. That's more than the volume of oil that leaked from the shattered hull of the Exxon Valdez in 1989. About 11 million gallons gushed from that ship. And 15.6 million gallons is almost certainly an undercount, because reports in drilling-heavy states such as Colorado, Oklahoma and Pennsylvania often exclude spill amounts. That figure also doesn't include spills from interstate pipelines or offshore wells. Companies reported that at least one-third of the spill volume from well sites was recovered. The frequency of the onshore spills shows companies aren't doing enough to stop them, said Wilma Subra, a Louisiana-based environmental scientist who monitors the oil and gas industry. "They admit that it happens all the time," Subra said. People who live amid the country's newly booming oil fields say the carelessness they see makes them worry about not only environmental damage, but also health and safety. "Every incident does make you pause and wish they weren't so close to homes," said Drovdal, a longtime Republican state legislator who goes by "Skip." Kristen Mesker and her husband have a 1,200-acre ranch in Burke County, N.D., amid the Bakken boom. They've seen a pasture and two wetlands (called "prairie potholes") destroyed by a hot water spill and had a calf die after falling in a waste pit. "All this stuff happens to our fences and cattle," said Mesker, who testified at the state Capitol earlier this year for legislation to keep wells farther from homes. "You wonder when that's going to happen to a family." Kristi Mogen said it has affected her family's health. One of her daughters had nosebleeds for days on end after a blowout last year that sent a stream of vaporized drilling chemicals into the air 2 miles from their house near Douglas, Wyo. A physical shortly after the incident showed she and her husband had depleted oxygen levels in their blood. "You feel helpless," said Mogen, who traveled to Washington, D.C., earlier this year to press Congress for stronger regulation of drilling. "It's not just us. It's happening all over the United States." Oil and gas industry officials say companies have a good overall record of safety and environmental protection. "We do take safety seriously. It is a top priority," Jack Gerard, president of the American Petroleum Institute, said in a brief interview during a recent API safety and reliability conference in Washington. "Over the years, based on the nature of producing energy, there are risks associated with it. But we do have a strong safety record." An API spokesman provided a 2009 study indicating that overall oil spillage in the United States has decreased by more than 75 percent since the late '60s. But it looks only at federal data, not the more detailed state data that EnergyWire reviewed. It also shows that the decreases were offshore, while inland spills increased. Gerard stressed the job creation and other economic benefits of the country's "game-changing" oil and gas boom. Drovdal said there's a difficult balance. "As a landowner, I'm very conscious of the damage done to the land," he said. "As a business owner, the checks are nice." There is no central repository of spill records from oil and gas production sites. The Bureau of Land Management keeps a record of spills on public lands, but the rest are kept in the databases, and sometimes the file drawers, of state agencies across the country. EnergyWire assembled the records of thousands of spills into a central database for comparison. The reports highlight the vast variety of ways that spills can happen. In the Newfield spill, there was a mechanical failure of well tubing. The drill pipe fired out of the hole like a bullet and lodged in the rig tower, spraying toxic mist into the wind. Newfield spokesman Keith Schmidt said the spill has been almost entirely cleaned up, and company officials "anticipate no lasting impact to human health." It was one of the more spectacular accidents last year, but at 50,000 gallons of oil, 30,000 gallons of salty wastewater and 2 million cubic feet of gas, it was far from the largest. More than a million gallons of salty "produced water" from coalbed methane drilling was released outside Gillette, Wyo., in August 2012. Earlier this year, there was a similar spill of nearly 3 million gallons. The water produced from shallow coalbed methane formations in that area can be clean enough for humans to drink, but the salt content can turn farmland hard as concrete. More than 300,000 gallons of oil and produced water spilled from a Citation Oil & Gas Corp. well site in Healdton, Okla., in April 2012, down a dry wash and into pastureland. Less dramatic accidents are far more common. Tanks overflow. Lightning strikes equipment and causes malfunctions. Valves get left open, letting oil or wastewater trickle into a ditch until the next crew comes in. Sometimes wandering cattle knock things loose. Pits and tank batteries can leak into groundwater for years before anyone notices. That's what a crew found last year at an old well near an irrigation ditch and reservoir outside Greeley, Colo. Tests showed the groundwater had 300 times the state's allowable limit for benzene. Anadarko Petroleum Corp. is contending with a long legacy of pollution from old wells in the Salt Creek field near Casper, Wyo. The company reported about 50 spills in the field in 2012 as it cleaned them up in preparation for using carbon dioxide to flush out more oil. Not all spills are accidental. Drillers reported vandalism at 21 Colorado well sites in 2012. And state officials are finding that truck drivers paid to haul briny drilling wastewater to approved disposal sites sometimes just dump it instead. Near Walden, Colo., last year a woman reported that she watched a waste hauler open the valves on his tanks. She followed his truck until he pulled into a nearby gas production site, leaving a trail of foul-smelling drilling wastewater on the county road. In Arkansas last summer, officials discovered at least 32 instances of wastewater haulers dumping their loads in the woods near well sites. North Dakota had the highest number of spills last year, 1,129, and one of its dominant producers, Continental Resources Inc., had more reported spills than any other company. But industry officials say that's likely because companies in North Dakota have to report more spills than in other states. In North Dakota, they have to report any spill of more than 1 barrel (42 gallons). In Texas, the threshold is five barrels. And in Oklahoma and Montana, it's 10 barrels. "The number of reports does not necessarily equate to large volumes, but more to achieving the transparency desired through state regulations," said Continental President and Chief Operating Officer Rick Bott said in a lengthy statement. Records show that of Continental's 233 spills in 2012, at least 90 were less than five barrels. Continental, which got extra attention in 2012 when CEO and founder Harold Hamm served as an adviser to Republican presidential nominee Mitt Romney, adopted a "no spill" policy focused on reporting, spill reduction and, ultimately, elimination, Bott said. It also has formed spill reduction task force teams to review incidents and implement solutions. Well sites are built and managed by a bevy of contractors, and Bott said Continental has a contractor management program that evaluates the firms' environmental performance. Continental's largest spill was in May 2012 in North Dakota's Divide County. The company's Hampton 1-2H well spilled about 80,000 gallons of produced water. No action was taken, state officials said, because it was contained to the site. North Dakota officials stressed that nearly 80 percent of the spills in the state were contained to the well site. "That's the important thing," said Alison Ritter, spokeswoman for the state Department of Mineral Resources. "If a spill is contained to the site, the environmental damage is going to be a lot less severe." Utah companies reported that 78 percent of spills were contained. In Colorado, the figure for how many were contained within a berm was lower, 38 percent. Occidental Petroleum had the second-highest number of spills, with 207, followed by BP PLC with 190, XTO and Exxon Mobil with a combined 172, and COG Operating at 122. Occidental spokesman Eric Moses said the company's spills have dropped dramatically in the past four years. The net volume of crude oil and condensate releases has dropped 80 percent, he said. "Preventing releases of crude oil is a priority in our operations," Moses said. Exxon spokesman Patrick McGinn said the company has sophisticated systems and training in place to prevent spills. He said most of its spills were water produced during operations. The rest, he said, "were small, and practically all were held within secondary containment systems without impacting the environment." Subra, though, cast skepticism on the idea that spills are contained as often as industry officials say they are, noting that state agencies rely on companies to self-report their spills. "You always say it was contained," Subra said. "If you say it wasn't, you have to answer a lot of questions. The easiest thing to say is that it was contained."